My daughter’s dream was crush when this app lied and she found out sabrán ain’t real. Go to NORAD instead of this! Very disappointing. We purchased this app early in the day on Christmas Eve. It started off telling us that Santa had not even left the North Pole. Shortly later it showed that Santa had been all over the globe, with no "plan". Santa had been in the US even though it was still daytime in all of the nation. We never did see the "Naughty/Nice" list. The free NORAD website was far better, more detailed and more fun. I suggest everyone save their money and go there. I am going to delete this app and use NORAD again next year. 2:00pm and they say Santa is still at the North Pole. My daughter said, "they just care about money" and she seems to be right. I saw the 5 stars, now know that does not mean much. Lesson learned. 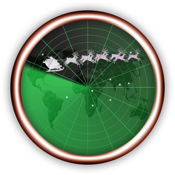 Bought this app today, Christmas Eve, thinking it would be better than the NORAD version. 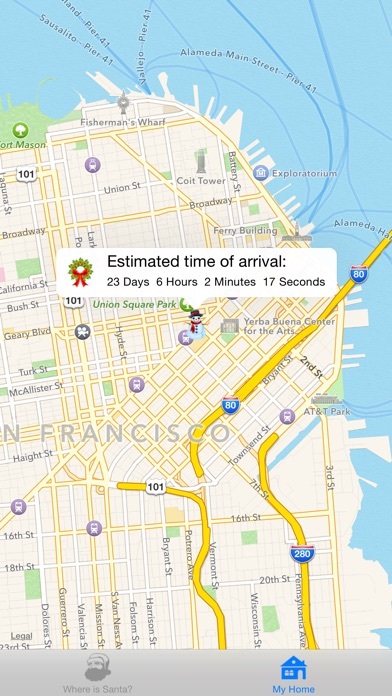 Santa's still sitting at the North Pole according to this, 12 hours before he's supposed to be here. I paid for a google map of my house with a countdown to midnight next to it. Waste of a buck. Hoping kids can learn a little world geography. But it's Christmas in some parts of the world already and Santa is still in North Pole! 99 cents for this boring and uncreative app? I thought the App Store was more cautious in allowing poor quality apps to make it. Save your money. Use NORAD. 3:06 pm Christmas eve and Santa is still in the north pole. It is Christmas in other parts of the world but apparently Santa is just going to chill at the NP. Save your dollar and get Santa GPS or the Norad app. This app doesn't work. 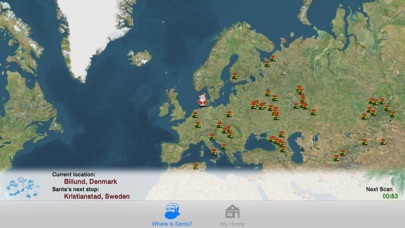 Santa is flying all over the globe right now but according to Where is Santa? the good fellow is still checking his list on the North Pole. Useless. Took forever for Santa to start flying. Then he's in places he shouldn't be. In Hawaii at 3 pm Hawaii time? Um. What!? Dont bother with this one. For my kids, it's a christmas toy; for me it's a christmas shopping countdown. Nice work! Worked fine on the days leading up to Christmas Eve, but it's now early morning in parts of the world, yet Santa is still at the North Pole? How am I supposed to explain that to my kids? Don't waste your money, use NORAD Santa Tracker instead. 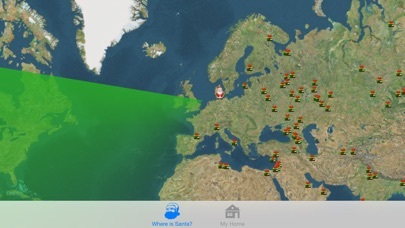 It is a cute app and the kids were excited to be able to track Santa. But the one day a year that it needs to work…it kept saying that 'Santa was in the North Pole checking his list. It did not update till after midnight of Christmas Eve. Better luck next year. This app told me that he was in Greenland 1 min. and then in Mexico the next! And it's 7:54 right now and it said he was in San Francisco. It's 4:54 there!?!? But other than that, it's pretty good app. WARNING DO NOT BUY!!!!!! App only does 2 things not worth .99 cents!! Says Santa is in the USA I am on the east coast and it's not even Christmas, its 8:20pm. He started on the west coast in California!! Needs to be in places where it is actually Christmas in those parts of the world. DO NOT BUY!!! Santa at North Pole on Christmas Eve? Does not load Santa's real position. Norad here I come! all day long on the 24th all i got was the naughty nice list message. all of a sudden at 4 in the afternoon 100 hits show up including our own. totally useless app. This app stinks you cant see the map of the world only the presents!! Santa never leaves the North Pole, even on Christmas Eve! Kids and parents were disappointed by this app! Save your money, this is a rip off! I highly recommend you get this app! Paying a dollar for it is worth it! Everyone is saying santa is not real but I am a true believer. Santa will always visit my house every Christmas. Stinks! Santa is still at the north pole. Stick to NORAD! Santa's still @ the North Pole? It's 10:54 am PST and Santa is still at the North Pole? NORAD says he's in India. This app blows. Thought it was neat showing what he is doing before Christmas but now he's just stuck at the north pole..... Waste of money!!!! It tells me Santa's ETA is: 6days 1hour, so excited!! Santa should have started moving hours ago. It's already Christmas in Asia and elsewhere. NORAD tracker works better.